The latest buzz around the sports car water cooler is that a refreshed Porsche 911 lineup, due in autumn of 2015, will signal the end of natural aspiration in the Carrera and Carrera S 911s, with a switch to smaller displacement and turbocharging in the name of addressing ever-tightening fuel economy and emissions standards. But in case this comes as a bit of bad news to some enthusiasts, there is a silver lining here. That silver lining is more power – a lot more, especially in the Carrera S. According to Car’s sources, the standard Carrera will ditch the 3.4-liter flat six in favor of a 2.9-liter turbo mill which is said to offer an output in the neighborhood of 400 horsepower and 400 pound-feet of torque, a significant increase from today’s 350 hp and 287 lb-ft. But the gains theorized for the Carrera S are even more substantial, as sources says the S will retain its current 3.8-liters of displacement but will still gain a turbocharger, bringing power to a decidedly meaty 530 horsepower and 520 pound-feet. 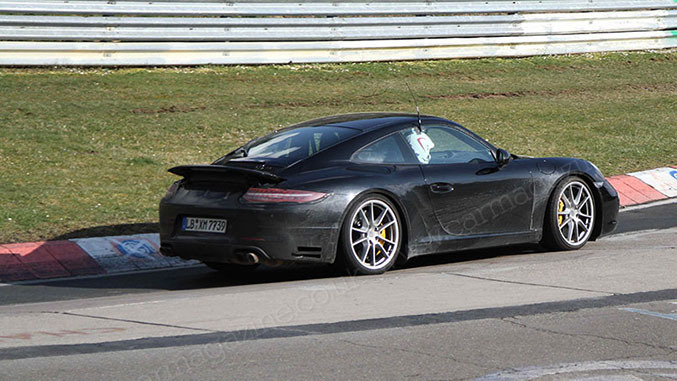 No word yet on what this means for the 911 Turbo, which normally occupies the 911’s forced induction space and whose power currently hovers around the theorized output of the new Carrera S, but it’s safe to say its output will likely increase substantially as well. As for the GT3, it’s said that it will remain naturally aspirated and instead focus on light weight, so a glimmer of hope still remains for 911 fans who prefer normally aspirated motors. Stay tuned for further updates as we have them.